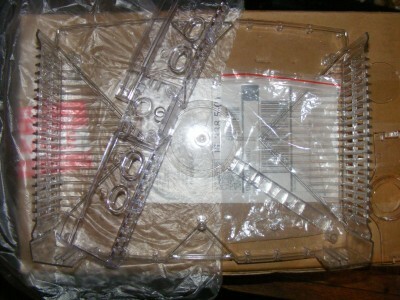 alright guys,,hi by the way i am new here..but i just grabbed up a clear case from ebay from clearxbox guys..man what a problem that order was i ordered 2 with the blue light kit and i got 1 throne in a box no packageing or anything all the loose pieces were just that lose in the box the case was not..they are supposed to be taking care of the rest of the order but im a little worried since there feedback went to crapp the week following my order..4- in 1 week. it came with the piece to put on the dvd drive but im not sure how it gos considering no directions and there online directions dont cover that question..there is a little part that has a hollow circle with a snapp top that i am figureing i need to tear aprt a drive lid and get the little spinner disk out of and put in there? ?has anyone else done this? ?and did it work i dont really want to ruin a drive top with would esently be just ruining a dvd drive without knowing,,im not even sure they sent everything for that? ?i can post pics of what they sent..
That part is for Phillips disk drives only bro so make sure you got the right drive to use that part. Hi, That DVD cover thing you have only works with Thompson DVD drive. you are right, you have to scavenge the `little spinner disk` and insert it jinto the bits you have ........... TBH its not worth the effort, while it looks cool it leaves the laser exposed. lol,conflicting it is..well i tried it on the philips it sorta fit but did not work so hot,,sometimes it would move and the disk would go flying,sometimes it just would not read the disk i think i am going to go without it and just do something cool to the top of the dvd drive..but i am still wondering wich drive it is for? ?phillips or thompson..
if you dont have what you want,,mod what you got!! lol, its a phillips ...... the holes dont match up on a thompson. Yeh its a phillips mate. If the holes dont match up you will need to buy an additional kit.. Doubt it will cost you much.. I had some trouble with a bluekit i got..
yea i have not been able to get it to work..there are two holes in the end but they dont match up with anythjing..
Ware the hells my prize man?